This cardboard box set contains all 38 Bach™ Original Flower Remedies and two 10ml RESCUE REMEDY®. 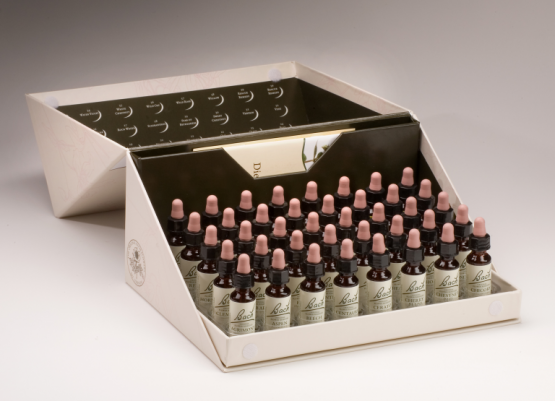 The 10ml Bach cardboard box set is ideal for professional practitioners and students alike and is beautifully presented in an attractive cardboard box. This is currently available with free shipping for UK orders. Agrimony Flower Essence 10ml Ingredients:Grape Alcohol (approx 27%v/v), flower extract of Agrimony Aspen Flower Essence 10ml Ingredients:Grape Alcohol (approx 27%v/v), flower extract of Aspen Beech Flower Essence 10ml Ingredients:Grape Alcohol (approx 27%v/v), flower extract of Beech Centaury Flower Essence 10ml Ingredients:Grape Alcohol (approx 27%v/v), flower extract of Centaury Cerato Flower Essence 10ml Ingredients:Grape Alcohol (approx 27%v/v), flower extract of Cerato Cherry Plum Flower Essence 10ml Ingredients:Grape Alcohol (approx 27%v/v), flower extract of Cherry Plum Chestnut Bud Flower Essence 10ml Ingredients:Grape Alcohol (approx 27%v/v), flower extract of Chestnut Bud Chicory Flower Essence 10ml Ingredients:Grape Alcohol (approx 27%v/v), flower extract of Chicory Clematis Flower Essence 10ml Ingredients:Grape Alcohol (approx 27%v/v), flower extract of Clematis Crab Apple Flower Essence 10ml Ingredients:Grape Alcohol (approx 27%v/v), flower extract of Crab Apple Elm Flower Essence 10ml Ingredients:Grape Alcohol (approx 27%v/v), flower extract of Elm Gentian Flower Essence 10ml Ingredients:Grape Alcohol (approx 27%v/v), flower extract of Gentian Gorse Flower Essence 10ml Ingredients:Grape Alcohol (approx 27%v/v), flower extract of Gorse Heather Flower Essence 10ml Ingredients:Grape Alcohol (approx 27%v/v), flower extract of Heather Holly Flower Essence 10ml Ingredients:Grape Alcohol (approx 27%v/v), flower extract of Holly Honeysuckle Flower Essence 10ml Ingredients:Grape Alcohol (approx 27%v/v), flower extract of Honeysuckle Hornbeam Flower Essence 10ml Ingredients:Grape Alcohol (approx 27%v/v), flower extract of Hornbeam Impatiens Flower Essence 10ml Ingredients:Grape Alcohol (approx 27%v/v), flower extract of Impatiens Larch Flower Essence 10ml Ingredients:Grape Alcohol (approx 27%v/v), flower extract of Larch Mimulus Flower Essence 10ml Ingredients:Grape Alcohol (approx 27%v/v), flower extract of Mimulus Mustard Flower Essence 10ml Ingredients:Grape Alcohol (approx 27%v/v), flower extract of Mustard Oak Flower Essence 10ml Ingredients:Grape Alcohol (approx 27%v/v), flower extract of Oak Olive Flower Essence 10ml Ingredients:Grape Alcohol (approx 27%v/v), flower extract of Olive Pine Flower Essence 10ml Ingredients:Grape Alcohol (approx 27%v/v), flower extract of Pine Red Chestnut Flower Essence 10ml Ingredients:Grape Alcohol (approx 27%v/v), flower extract of Red Chestnut Rock Rose Flower Essence 10ml Ingredients:Grape Alcohol (approx 27%v/v), flower extract of Rock Rose Rock Water Essence 10ml Ingredients:Grape Alcohol (approx 27%v/v), extract of Rock Water Scleranthus Flower Essence 10ml Ingredients:Grape Alcohol (approx 27%v/v), flower extract of Scleranthus Star of Bethlehem Flower Essence 10ml Ingredients:Grape Alcohol (approx 27%v/v), flower extract of Star of Bethlehem Sweet Chestnut Flower Essence 10ml Ingredients:Grape Alcohol (approx 27%v/v), flower extract of Sweet Chestnut Vervain Flower Essence 10ml Ingredients:Grape Alcohol (approx 27%v/v), flower extract of Vervain Vine Flower Essence 10ml Ingredients:Grape Alcohol (approx 27%v/v), flower extract of Vine Walnut Flower Essence 10ml Ingredients:Grape Alcohol (approx 27%v/v), flower extract of Walnut Water Violet Flower Essence 10ml Ingredients:Grape Alcohol (approx 27%v/v), flower extract of Water Violet White Chestnut Flower Essence 10ml Ingredients:Grape Alcohol (approx 27%v/v), flower extract of White Chestnut Wild Oat Flower Essence 10ml Ingredients:Grape Alcohol (approx 27%v/v), flower extract of Wild Oat Wild Rose Flower Essence 10ml Ingredients:Grape Alcohol (approx 27%v/v), flower extract of Wild Rose Willow Flower Essence 10ml Ingredients:Grape Alcohol (approx 27%v/v), flower extract of Willow RESCUE REMEDY® 10ml :Grape alcohol(approx 27%v/v) Flower extract of Rock Rose, Impatiens, Clematis, Star of Bethlehem and Cherry Plum. Contains negligible amounts of fat, saturates protein and salt.